Today began at 7:00 a.m. when our group met up at Carleton and departed for the Ottawa Mission, located near Rideau Centre downtown. We brought along with us 24 loaves of bread and 16 containers of peanut butter and jam. 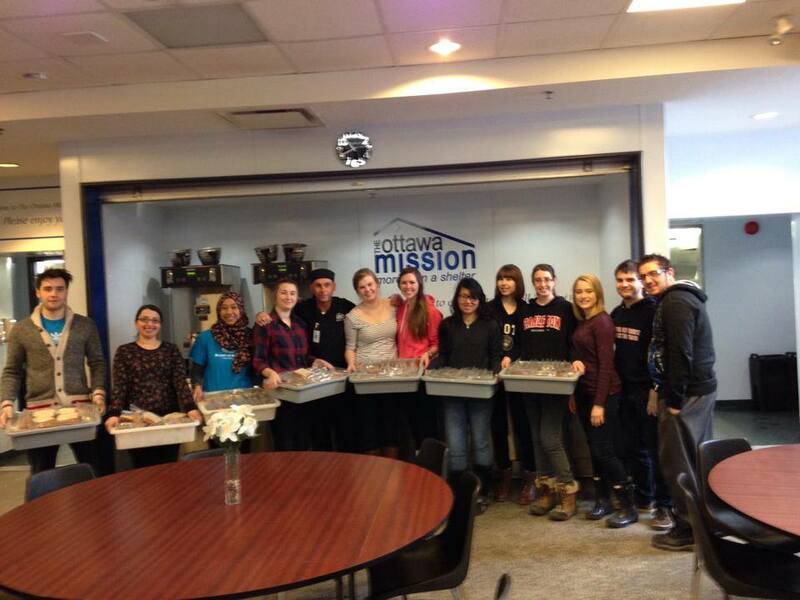 The 250 peanut butter and jam sandwiches we made at the Ottawa Mission. Today began at 7:00 a.m. when our group met up at Carleton and departed for the Ottawa Mission, located near Rideau Centre downtown. We brought along with us 24 loaves of bread and 16 containers of peanut butter and jam. Amber, a lovely social worker, greeted us upon arrival and showed us an amazing video highlighting different services the Ottawa Mission provides to visitors and residents which include shelter, addiction counselling and job training. The Ottawa Mission is primarily a homeless shelter for men. The Mission provides spiritual support for its visitors but refers women and children to other shelters to sleep in. Every night, more than 235 men use the homeless shelter, which provides more than 1,295 meals per day, for a total of 472,793 meals per year. We helped make one of those meals. For two hours we made peanut butter and jam sandwiches and placed them into Ziploc baggies. We made these sandwiches in front of a huge mural with the quote: “People have to eat well to be well.” This quote stayed with me throughout the whole process of preparing the food. Although these sandwiches may seem like very little, they contributed to the first step towards allowing these men to escape the cycle of poverty. I really enjoyed the Ottawa Mission because it struck me as a place that attempts to restore dignity to their visitors through the layout of the tables, the quotes on the wall and the job training they provide. After finishing at the Mission, we went onto the Drug Users Advocacy League (DUAL) at 216 Murray Street. DUAL is an independent social justice group of drug consumers, ex-drug consumers and allies who fight for the rights of those that use drugs in Ottawa. 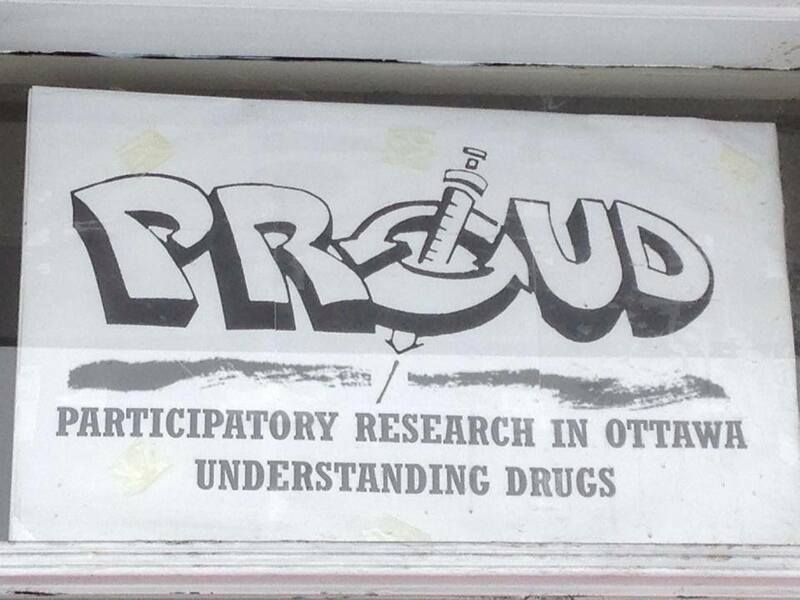 They do not condone drug use, but they believe in complete evidence based harm reduction. Their aim is to improve the safety and education of and towards drug consumers and to our community. DUAL strives to end the horrible stigma, disease, death and persecution behind drug abuse. The front door of DUAL (Drug User Advocacy League). While visiting, we got the chance to speak with two activists who are the driving force behind DUAL. Sean LeBlanc told us his story of abuse in foster care homes and the tragedy of how his pregnant partner drowned, which was the impetus for his drug use. After years on the streets he sought help from the various programs for drug users in Ottawa and was provided with Methadone, which contributed to his success of becoming completely drug free! The second activist, Catherine Hacksel, is a recent Carleton communications student who has never used serious intravenous drugs. She provided us with a lot of information on the struggles DUAL faces – especially in receiving political and financial support. The most interesting program that DUAL is working on, with the Campaign for Safer Consumption Sites in Ottawa, is the creation of Ottawa’s first ever supervised consumption site. This is a model of the only safe injection site in Canada, Vancouver’s INSITE program, which serves as a safe, health-focused place where people inject drugs and connect to health care services. It provides primary care to treat disease and infection, to addiction counselling and treatment, to housing and community supports. It has been extremely successful in preventing more than 35 HIV infections and saving more than $8.7 million in healthcare costs every year, as HIV treatment programs cost $250,000. Additionally, they have been successful in lowering fatal overdoses in the vicinity of INSITE by 35 per cent and INSITE users are 30 per cent more likely to seek addiction treatment.